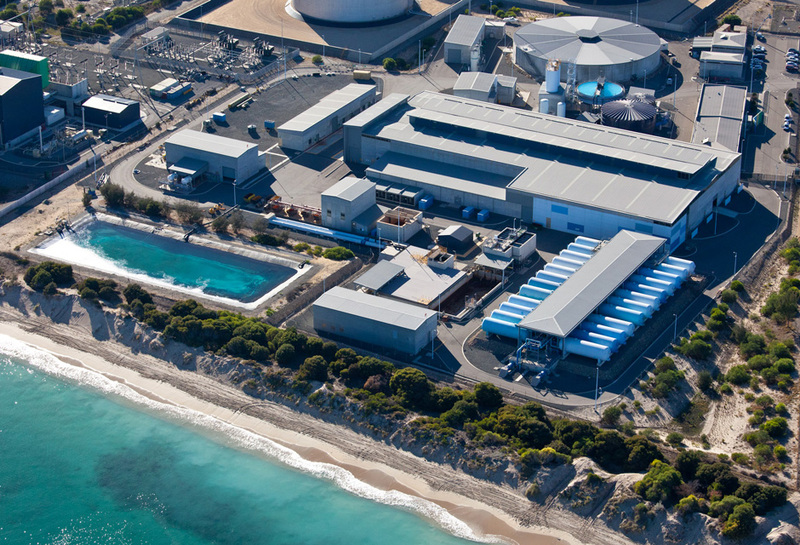 In April 2005, Western Australia's Water Corporation chose SUEZ to design, build and operate Perth's first seawater desalination plant using reverse osmosis technology, the largest such plant in the southern hemisphere at the time. The 143,000 m3/d plant was built at Kwinana, 25 kilometers south of Perth in Western Australia. The aim was to increase drinking water production capacity for Perth, where conventional freshwater resources are in very short supply. The facility was designed and built under a joint venture between Degrémont and its Australian civil engineering partner Multiplex Engineering Pty Ltd. It includes seawater intake, pre-treatment structures, reverse osmosis desalination units and pumping and remineralisation units. The facility started operating at the beginning of the Australian summer in October 2006, just 18 months after the award. After screening and pumping, acidification with H2SO4 then coagulation with FeCl3 and organic coagulant aid. 2 banks of 12 pressure dual media filters (anthracite + sand) for a total seawater flowrate up to 14,800 m3/h. 2 banks of 7 cartridge filters each fitted with 360 cartridges (5 microns). To achieve a salinity less than 200 mg/l and a bromide content less than 0.1 mg/l, the SUEZ RO design incorporates a double pass. 1st pass: 12 trains, fitted with 162 Pressure Vessels each. 2nd pass: 6 trains, fitted with 124 Pressure Vessels each. All operating parameters fully controlled by means of pressure and flow control loops to automatically compensate temperature fluctuations and membrane permeability and to optimize the energy consumption. Final adjustment of pH by injection of CO2.